Give me Liberty or give me Tools! 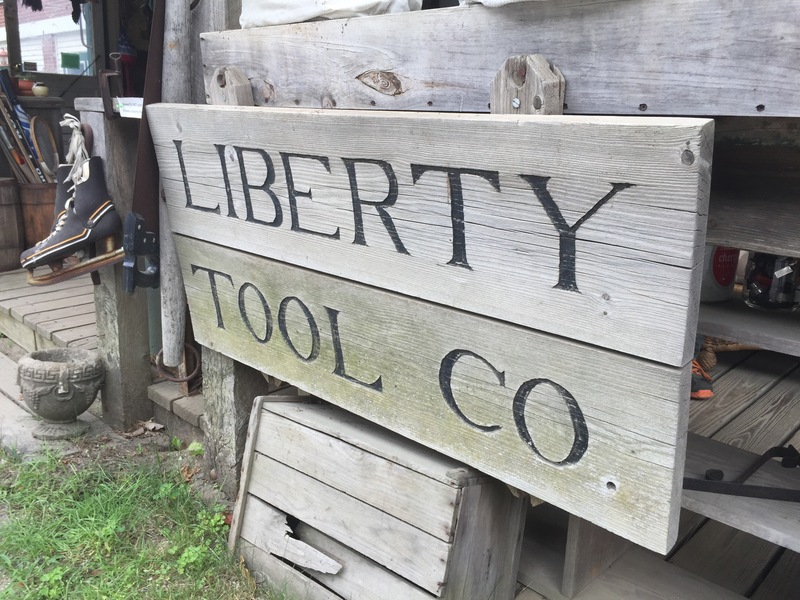 This summer I made the pilgrimage to Liberty Tools. I had to drop my son off for camp in Portland, Maine. I was by myself so I figure I’d trek a little further north and check out the hand tool mecca I’ve read so much about. I’ve gotten more into hand tools lately and thought I would see what I could find. My brother has a place in Maine, so I’ve made the trip to Lie Nielson, stopped in at the Center for Furniture Craftsmanship and enjoyed all that Maine has to offer. I figured there would be some quaint place along the way, a place by the road to grab a killer lobster roll, perhaps do a little antiquing, ya know– Maine stuff. Well not so much. I love a road trip and I am always up for an adventure, but this place is out there! As always the anticipation was enough to keep me going. After turning down a nondescript road I finally arrived in Liberty. Don’t blink or you’ll miss it. 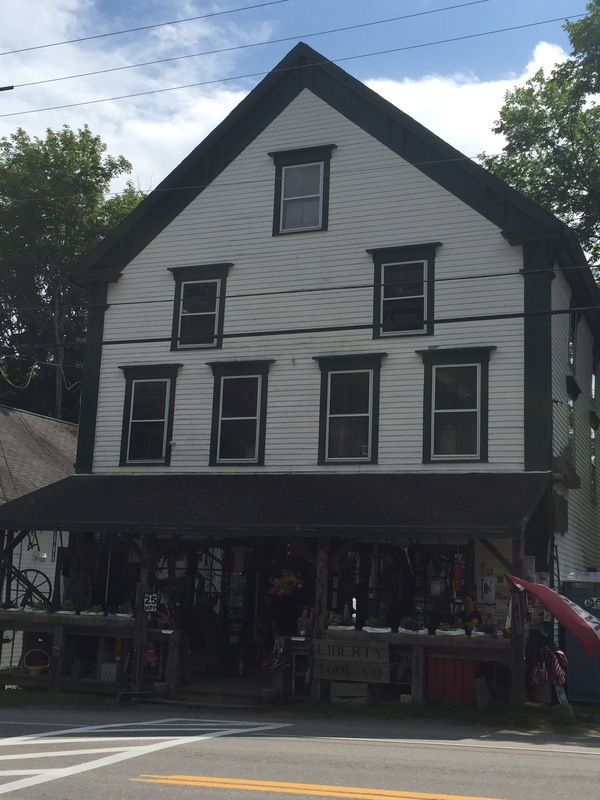 There are approximately five buildings in the town, two of them belong to Liberty tools. I started out in there main building, an old general store I presume. 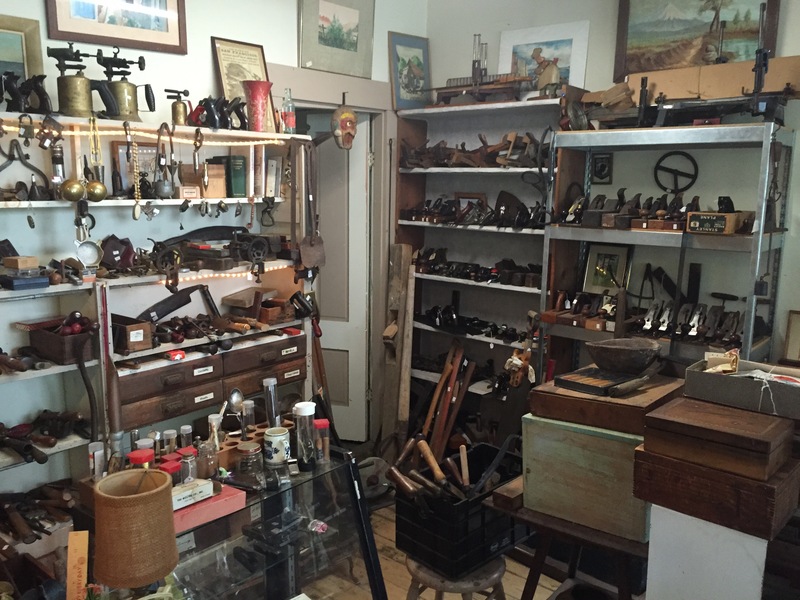 It has that old antique store summer smell to it and is jam packed with tools! It is overwhelming at first and your not sure where to start. It had never occurred to me but woodworking tools are just a portion of the inventory. Every trade seems to be represented. The really stunning part is to stop and think for a moment at how many jobs these tools have done. 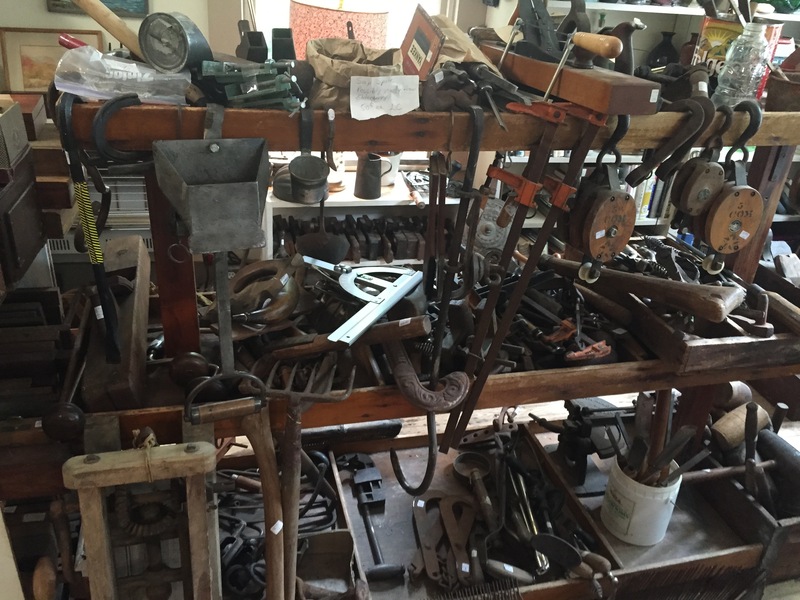 How many houses, barns, shelters, furniture, vehicles, toys….wow, the stories these tools could tell! I love this stack of saws. So beautiful. Its fun to think how many people owned each saw. Were they handed down from father to son, borrowed from a neighbor, spent all of its time in one trade-man’s shop, abandoned in a barn? What caused all that wear and tear? Each one has so many stories. But I have to be honest. As I meandered through the shop I grew rather disheartened. I had hoped to find a few woodworking braces, a set of tiny awls and perhaps a small treasure. 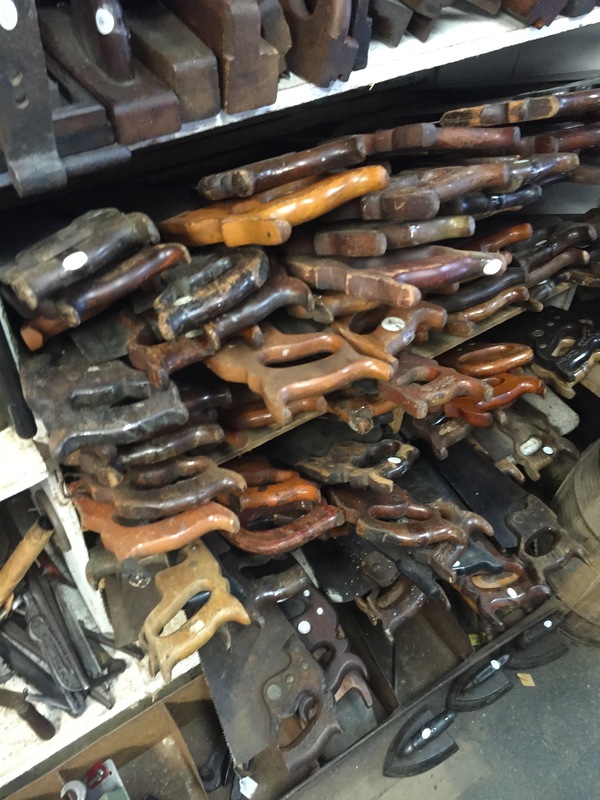 Instead I found a massive assortment of well used tools. Tools that showed more than their age, but rather battle scars from a century of use and abuse. I was on search for a tool that I could proudly bring home, take apart, remove the rust and restore to a working tool on my bench. I came home (almost) empty handed. Its not that those tools can’t be found, especially at Liberty, or don’t exist anymore, it’s that someone else has come though and beat me to it. I got real sense of what pickers and Ebay has done to a place like Liberty. Perhaps its even financially good for the proprietors and they’re thrilled to see a professional buyer come through the doors and walk out with a truck load of profitable antiques, but for the rest of us, the scavengers looking for a bargain, its a little disheartening. Someone has beaten us there. I’ve been hesitant to write this, because I don’t want to spread anything negative about a mom and pop establishment, one of the last of its kind for sure. Perhaps it just wasn’t my day. After all, as with any antique hunting, its always hit or miss. So if you find yourself in that tiny corner of the country, by all means, take the time to stop in. I am sure I will again. Perhaps we can beat the pros to the next pile of treasures!